The line always had a chequered existence, being hampered by competition from the nearby Metropolitan Line. The Underground provided a direct service to London, while the best the Croxley Green branch could offer was a shuttle service to and from Watford Junction. Some attempts were made by Network SouthEast in the 1980s to revive the branch. However by the early 1990s the management had given up: the service on the line was reduced to Parliamentary levels, with a single return journey each morning at around 7am. In 1996 the fatal blow came when a new road bypass was built across the route of the railway. With the cost of a bridge being unjustified, the railway was severed and the train service finally ceased. However, this was not the end of the line; British Rail, as usual, did not want the expense of the formal closure procedure. The token train service was duly replaced by road transport, but a bus was considered too extravagant for the expected passenger numbers and a taxi was used instead. For five years this situation persisted, with the newly privatised Silverlink Metro forced to continue paying for the taxi until June 2001 when approval was finally given to officially close the line. The official closure would normally be the end of the story. 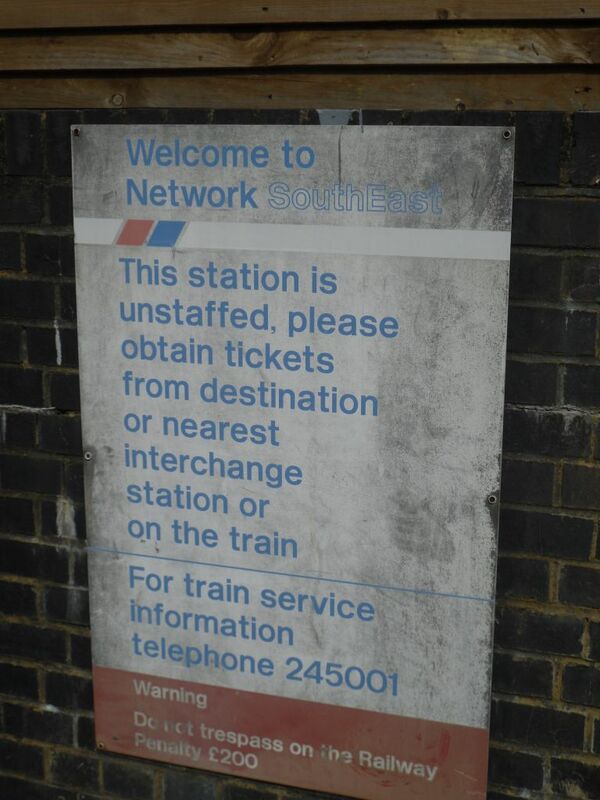 However, for some reason the stations on the line were left untouched after closure: little or no demolition work took place and signs and furniture were left intact. Ten years later and the stations are still there, albeit damaged by the ravages of time and vandalism. This bizarre situation fascinated me and I was keen to see it for myself. 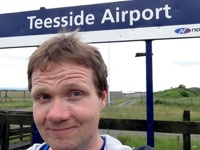 An experience such as this is always better shared and I was pleased to be joined on the trip by two companions: first, the intrepid Mersey Tart himself – semi-regular fellow traveller, Scott Willison. 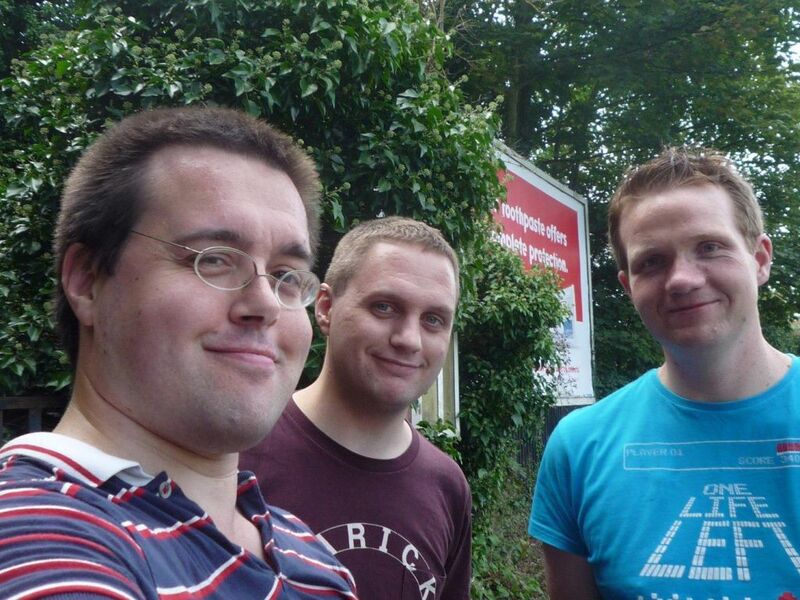 Also accompanying us was Ian Jones, who has been a frequent commenter on both this site and my personal blog. Ian writes about his railway experiences at his To the End of the Line and A Railway Runs Through It blogs, while also finding the time to record an album and contribute to TV Cream. I had planned my trip well in advance – well, I looked up the stations on Wikipedia and transferred the given locations into Google Maps. We wandered away from the High Street into the suburbs, with me holding my iPhone aloft like Beverly Crusher would wield a tricorder, trying to, as Commander Riker would put it, “get a fix on our location”. 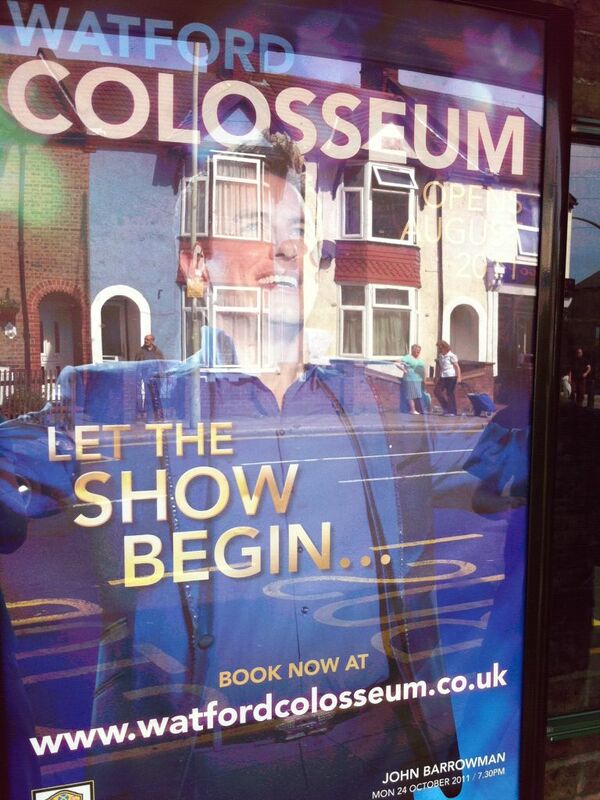 BARROWMAN! There is simply no escaping the man. Not content with seducing lithe Italian men on Torchwood, he is now preparing to unleash his unique charms on the denizens of Watford. Tickets are still available, so to avoid disappointment, don’t book now. We passed Watford FC’s Vicarage Road stadium (home of The ‘Orns!) and a few minutes later reached the station which once served it. 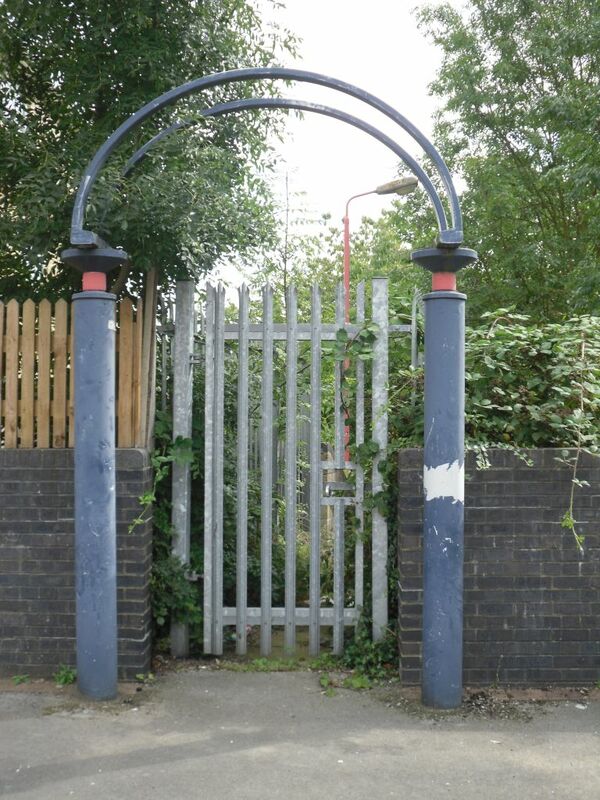 Watford Stadium Halt was opened in the 1980s, a welcome but ultimately futile show of faith in the line’s future. Built to cater for football crowds – at a time when Watford were enjoying an Elton John-inspired moment of glory in the top flight of English football – its fortunes declined along with the club’s and it closed along with the rest of the line. There was not much left to see. 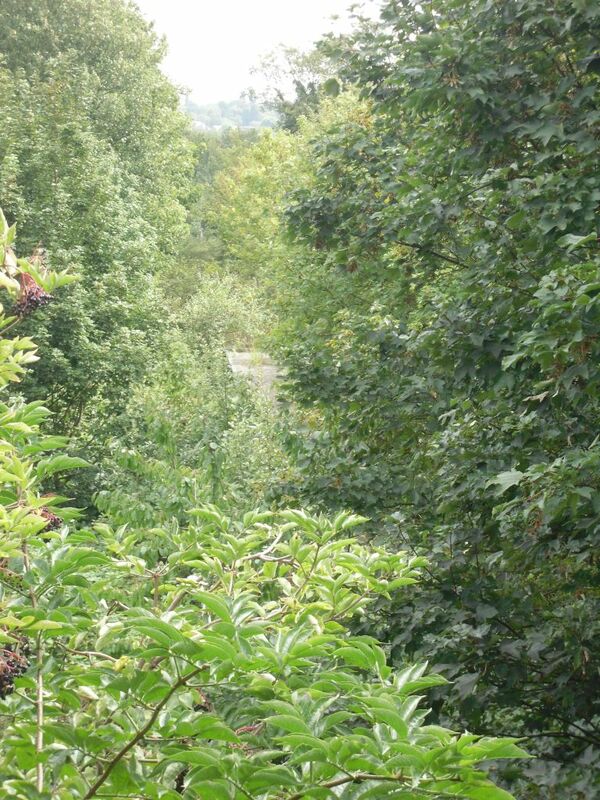 Fifteen years without a train had left the station exposed to nature, with the former trackbed well and truly colonised by trees and shrubs. A platform could be seen poking out of the undergrowth together with a lamppost in faded Network South East red, but there was no station sign, or even any hint of where the entrance might once have been. Slightly dejected at the lack of visible signage, we moved onwards, passing through an estate of charmless 1980s flats. Each block had been named after islands (“Sark House”, “Jersey House” etc) in a seeming attempt to give the buildings an air of rural idyll. The rotten wooden window frames told a different story. 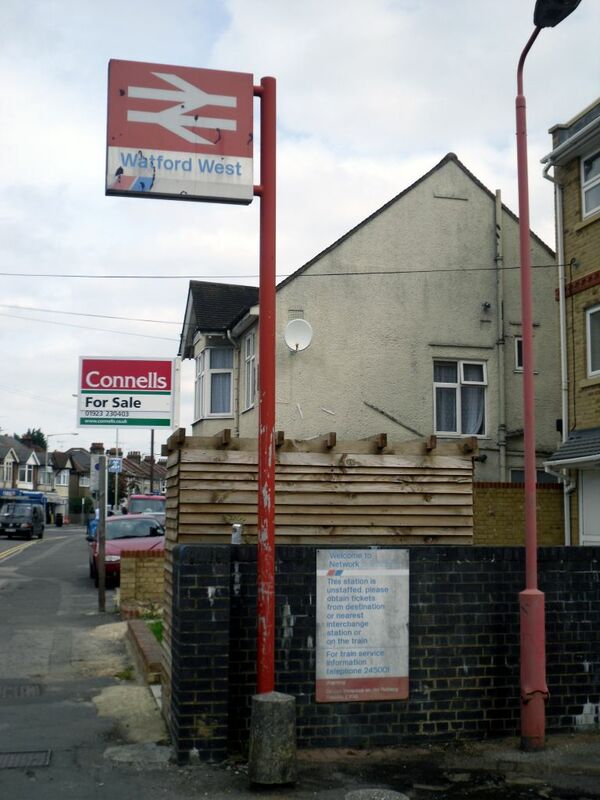 Watford West station was last served by a train in 1996 and closed officially in 2001. But to the casual observer, it looks like it is actually still open. The line here is in a cutting, with a flight of steps down to the single platform. 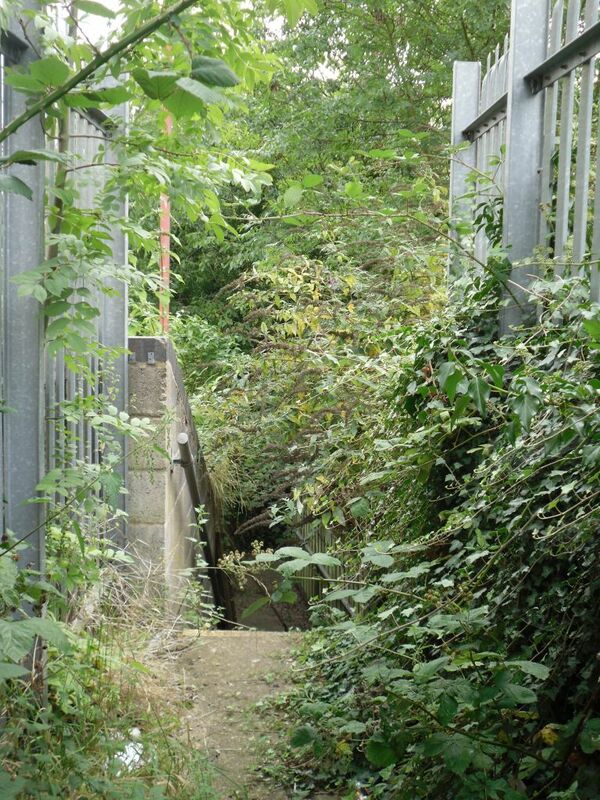 As at Watford Stadium, nature is rapidly reclaiming the line for its own purposes. The whole place resembles the set of a post-apocalyptic sci-fi film, with the familiar features of a railway station still more-or-less intact but now neglected and covered in weeds. There’s even a phone number to call for train service information. I was sorely tempted to phone it and see what happened, but as I’m not the wacky presenter of a local radio breakfast show, I decided against it. A quick spot of after-the-event online research reveals that 01923 245001 is no longer a railway number. Ironically, dialling it these days will connect you to a car rental firm. Getting the required Station Master pic proved to be a long-winded process. With Ian, Scott and myself each wanting our own memento of the place, we had to form an orderly queue in front of the sign. On the plus side, having two people along with me avoided the need for any awkward self-portraits (see my Salwick blog for a prime example of that). 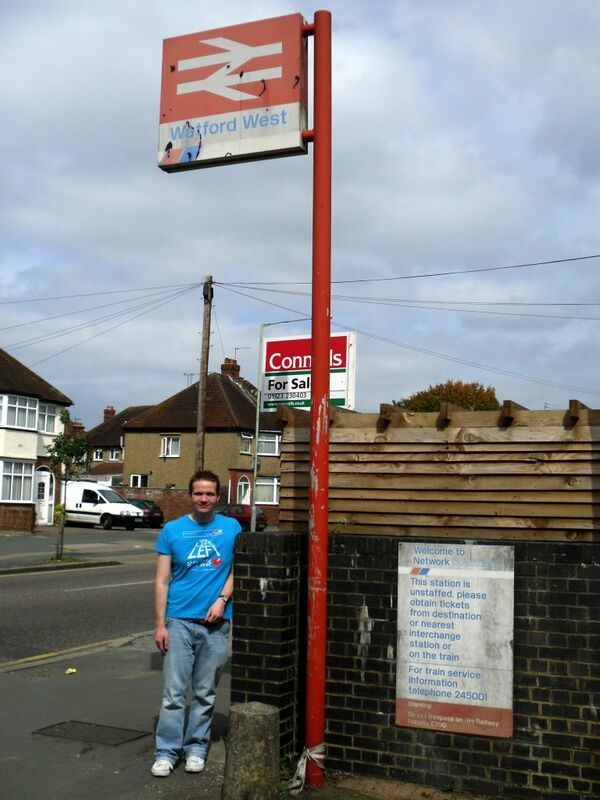 Happy at the pickings on offer at Watford West (at least in comparison with the Stadium station), I struck a cheerful pose beneath the battered sign. Cool Blog, I came across this via a link on the Around The Merseyrail one!. I remember listening to a programme on Radio 4 a while back (I don’t normally listen to R4, I’m a R6music kind of bod honest), called Ghost Stations, and the reporter caught the one train a week from Stockport to Stalybridge, together with a throng of people (the train was packed),I think a lot of the punters on the train regularly made the journey, in order to get from South Manchester to Stalybridge, without having to go into Manchester…..interesting blog. I had forgotten about the Watford-Croxley Green branch line, I think there used to be a Depot there for the (class 501?) units, I bet there was no sign of that, I hope that Merseyrail replace their 508’s with re-configured London Overground trains, everyone thinks they are cool. Yes, good blog, which I found via diamond geezer. 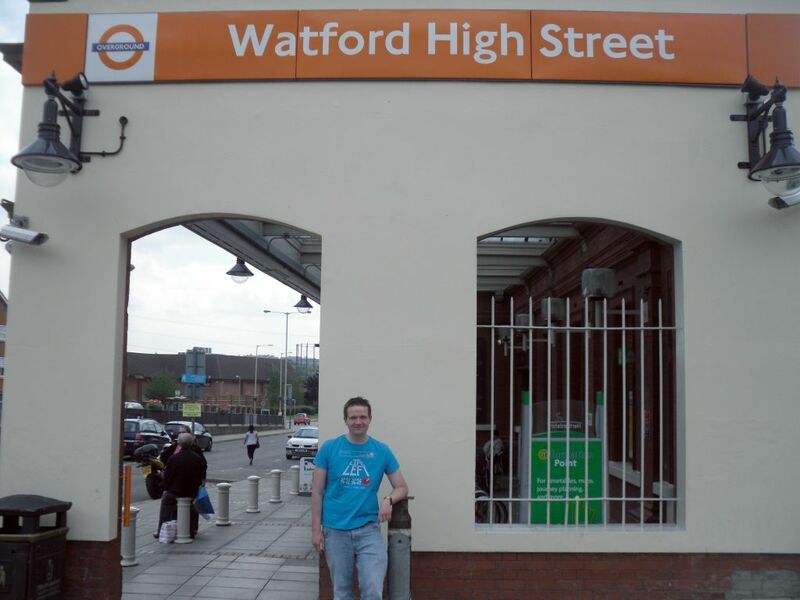 I vist Watford frequently but have never been to Watford West station (use High Street a lot though to get to Harrow). What road is Watford west on. Tolpits Lane. I just walked past it. It looks like you can have a good walk down the railway tracks. Not sure where they go though. Anyone?